Dissertation Question: Facebook privacy: IS IT TO BE TRUSTED? “The world has changed; it has become more public than private” (Kirkpatrick et al., 2010). The likes of Social Media has become an outlet that nobody can ignore, its features, characteristics and convenience encapsulates all that is needed for any walk of life chosen by an individual. Of course with the undying support for social media, especially Facebook, one has to ask his or herself, is it to trusted? Is my information being kept privately like they said it is? Some believe it is however some feel that is far safe. However, this study is going to give a clear-cut decision as to what the majority think and why. Of course, there is no right or wrong answer, and there is the likelihood that this study may not affect the broader picture, but it will give clarity and I think that is necessary.As supposed to concentrating on Social Media as a general platform this study will revolve around Facebook only so as to have a more tailored and focussed reading. I have chosen Facebook, because this is the Social Media outlet that revolutionised all those that were to follow. Both sides of the arguments will be welcomed with reasons for balance and recommendation will be ushered as to how Facebook could become the safe zone that everyone urges for. DOES PRIVACY EXIST IN FACEBOOK? Human beings are defined as social beings meaning they thrive through interpersonal interaction. This interaction comes with sharing of information to build relations. However, the information should never come from a third party. In the ancient years, this was something very easy to ensure due to the existent media of communication at the time (Eric, 2007). However, the technological realm has improved immensely by coming up with communication channels that traverse geographical distance and enhance communication convenience. Today, using social media one can easily communicate with any person in any corner of the planet and with this convenience comes the risk of third party infringement in the communication process (Fogel & Nehmad, 2009). Facebook is probably the most used social media platform in the world meaning it is a powerhouse for information and the highest in risk when it comes to privacy hence raising concerns as to whether this online platform is to be trusted. Facebook gives users the chance to make sure that what they share does not end up in the wrong hands. This is made sure using the above meters. Additionally, a user’s information is made safe from misuse by using the company’s data policy as a blue print (Liu, Gummadi, Krishnamurthy, & Mislove, 2011). Although, they collect all information shared on the media such as messages, financial information and images the company maintains that this information all goes towards enhancing the user experience by making the entire communication process more convenient (Boyd & Hargittai, 2010). However, although they collect information the company does not really infringe on the rights of the individual. It is the users’ ignorance or lack of knowledge of the privacy feature that induces the privacy concerns (Bedi, 2013). It has been said that there is no secret between two people, so the moment one shares something on Facebook, they should know that the information is visible to all their friends. To protect the privacy of the shared information, Facebook advices one to only accept friend requests of those people they know (Statt, 2013). Additionally, today most employers do not seek out members of staff the traditional way, today they seek them out socially, this includes using their social media sites to look for information about them (Ostrow, 2009). Social media is a platform where people think they can share most of the things they cannot in their day to day conversations. Furthermore, it is an avenue where people can take on any character they want (Liu, Gummadi, Krishnamurthy, & Mislove, 2011). However, what one shares speaks volumes to those people on your friends list or anyone who is interested to see your activities online more so to a prospective employer. An employer may stumble on a post that may not really augur well with him or her and hence cost one a job opportunity. Therefore, for one an individual can control what they share to ensure they do not share anything another person may deem inappropriate (Warren, 2013). On the plus side is that its policy outline that the information they collect does not find its way to a third party, something they have proved time and again by incorporating more and more measures that spearhead their data policy (Zilles, 2017). On the other hand, an individual should quit being oblivious of the privacy policies they can enforce on the contents they share. This way even if an employer was to stumble upon their account, they cannot get to see their posts (Hoffman, 2012). This gives the individual a level ground where they can compete with those eying the same position on several fronts where social media posts is not one of them. On this note, I take a stance that Facebook privacy can be trusted at all costs and that it is the users who need to learn how to use them to their advantage (Warfel, 2008). My chosen approach will be a combination of primary research and secondary research. These will be a mix of qualitative and quantitative data and also secondary research from journals, books, articles ect. My topic may sound cliché and too common, but there are many unanswered questions surrounding this topic that still make it an entertaining and intriguing to read about and because of this there are many objectives that need to be requited. These objectives will be direct, and informative but most importantly will leave room scrutiny and constructive criticism, after all there is no right or wrong answer. To what extent has Facebook bewitched individuals to believe that is safe. To prove if at all Facebook is an outlet to be trusted and why. In order to do justice to the objectives data collection will be done via questionnaire that will be sent out over a specific period of time to a specific target audience of about 50 or more people. This will be the bases of my primary data, but the formation will mostly derive from credible sources of secondary data, namely: the guardian, telegraph and electric forums (Survey Monkey). This all will be emulated to create a constructive argument. The biggest advantage is that I am surrounded by people of the same age group from different cultures, backgrounds, ages, points of views that use outlets such as Facebook, many may not use it at all which again gives room for a smorgasbord of ideas that are at my disposal. This will make my primary data concrete, accurate and give it a sense of validity. Since Facebook is a global company, information will gathered globally and not only from London or the UK, this allows leverage and gives more to talk about. In terms of target audience, since people of all ages use Facebook my data will not only be focussed on the younger generation but older and this is where secondary data comes in use. If done appropriately the objective and overall dissertation should be answered. Bedi, M. (2013). Facebook and interpersonal privacy: why the third party doctrine should not apply. DePaul University College of Law, 1-73. Boyd, D., & Hargittai, E. (2010). 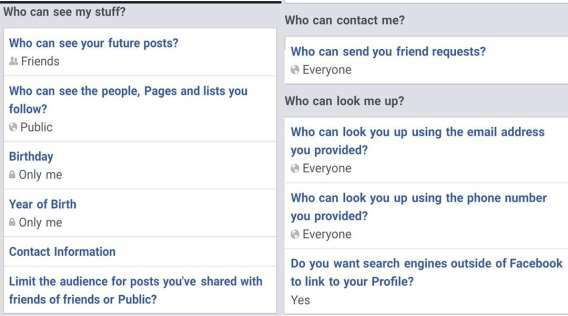 Facebook Privacy Settings: Who Cares? First Monday. Available at: journals.uic.edu/ojs/index.php/fm/article/view/3086/2589 (Accessed: 23 February 2017). Eric, B. (2007). Privacy in social networking: A usability study of privacy interfaces for Facebook. Thesis: Harvard College, 1-125. Fogel, J., & Nehmad, E. (2009). Internet social network communities: Risk taking, trust, and privacy concerns. Computers in Human Behavior, 153-160. Hoffman, B. C. (2012). An exploratory study of a user’s Facebook security and privacy settings. Theses: Minnesota State University, 1-59. Kirkpatrick, marshall, kendall, len, young, mat, macmanus, richard, lardinois, frederic, jeffries, adrianne, Curry, D., Sponsors, R., Wolf, D., Jacobs, C.C. and Power, D. (2010) Why Facebook is wrong: Privacy is still important. Available at: http://readwrite.com/2010/01/11/why_facebook_is_wrong_about_privacy/ (Accessed: 23 February 2017). Liu, Y., Gummadi, K. P., Krishnamurthy, B., & Mislove, A. (2011). Analyzing facebook privacy settings: User expectations vs reality. ACM Digital Library, 61-70. Ostrow, A. (2009, September 16). Privacy: Facebook is one of America’s most trusted companies. Available at:mashable.com/2009/09/16/facebook-privacy-truste/#1l1mcuoc7o (Accessed: 23 February 2017). Raynes-Goldie, K. S. (2012). Privacy in the age of Facebook: Discourse, Architecture, Consequences. Theses: Curtin University , 1-266. Statt, N. (2013, May 3). Facebook’s new trusted contacts: can you really trust your friends. Available at: readwrite.com/2013/05/03/facebooks-new-trusted-contacts-can-you-really-trust-your-friends/ (Accessed: 23 February 2017). Warfel, E. A. (2008). Perceptions of privacy on Facebook. Thesis: Rochester Institute of Technology, 1-32. Warren, K. (2013, May 13). Recruiting in today’s social media age: How to manage your online presence. Available at: www.devex.com/news/recruiting-in-today-s-social-media-age-how-to-manage-your-online-presence-80932 (Accessed: 23 February 2017). Zilles, C. (2017, January 17). Can Facebook be trusted with all your personal information. Available at: socialmediahq.com/can-facebook-be-trusted-with-all-your-personal-information/ (Accessed: 23 February 2017). "Can Facebook Privacy be Trusted?." UKEssays.com. 11 2018. All Answers Ltd. 04 2019 <https://www.ukessays.com/essays/internet/facebook-privacy-trusted-1238.php?vref=1>. "Can Facebook Privacy be Trusted?." All Answers Ltd. ukessays.com, November 2018. Web. 19 April 2019. <https://www.ukessays.com/essays/internet/facebook-privacy-trusted-1238.php?vref=1>. UKEssays. November 2018. Can Facebook Privacy be Trusted?. [online]. Available from: https://www.ukessays.com/essays/internet/facebook-privacy-trusted-1238.php?vref=1 [Accessed 19 April 2019]. UKEssays. Can Facebook Privacy be Trusted? [Internet]. November 2018. [Accessed 19 April 2019]; Available from: https://www.ukessays.com/essays/internet/facebook-privacy-trusted-1238.php?vref=1.